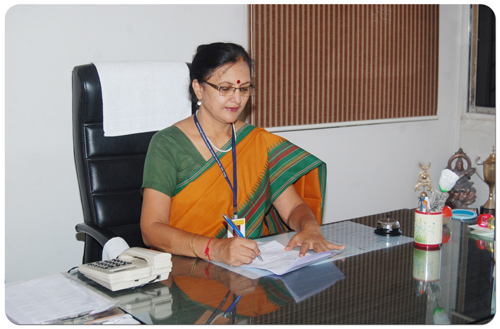 Smt.P.K.Kotecha Mahila Mahavidyalaya, run by Shri. SaraswatiVidyaPrasarak Mandal is the premier and only women college in Bhusawal. It is imparting higher education since last 35 years with vision Enrichment of Women through quality higher education for better society and stronger nation. Quality enhancement is our prime focus. Considering the importance of corporate culture product trend, the professional approach is must. So we attempt to give professional touch to the campus. We avail maximum placement opportunities to our students to make them self sufficient. Our objective is to bring women as a weaker section from rural and semi urban area to the main stream of the society and broaden their vision. We seek to provide smooth, healthy and positive environment for interpersonal relationship between students, staff teacher and society as a whole. Discipline of the campus is our strength. Self-disciplined as we are, marching ahead every year towards our goal. I am sure the college will continue to work for attaining academic excellence and will follow holistic approach to higher education catering to the physical, intellectual and spiritual development of the students in the years to come. I convey to all the staff members, students and stakeholder good luck and grand success.